The Artist Loft @ The Mayhew Inn - Rooftop Decks, Walk to all restaurants+shops! 2 bedrooms + 1 bath. Overlooks Grand Marais Harbor. An unmatched view!! Stay at the "Artist Loft" part of the all new Mayhew Inn. The only boutique hotel in all of Grand Marais. Right on Main St, in the heart of downtown Grand Marais! The best views of the Harbor in all of downtown. The Artist Left is the 2nd floor above the Storefront Vacation Rental. Ask about renting multiple units together to accommodate larger groups. The Artist Loft is right in the heart of downtown Grand Marais on beautiful Harbor Park. It's eclectic design and views give it an incredible cozy feel.downtown has to footsteps out the front door. 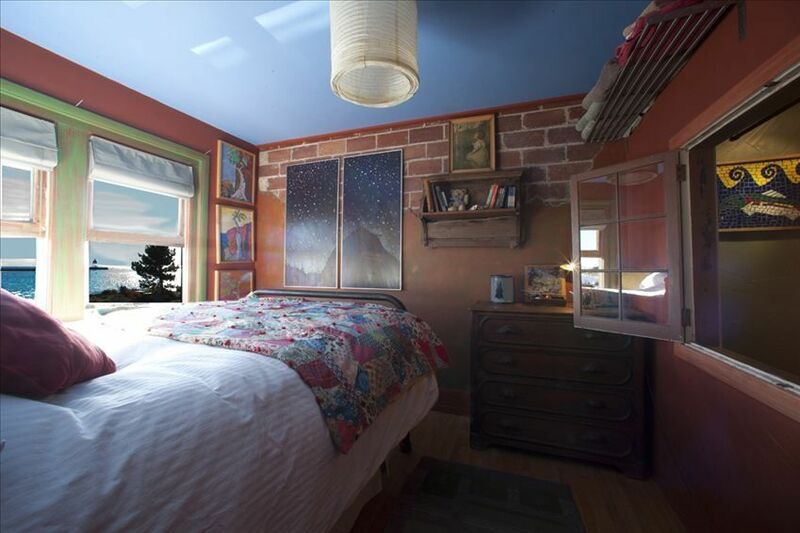 The Artist Loft has two bedrooms and one bathroom. The 6 individual units that make up The Mayhew Inn are uniquely designed and built to be modular. Add to that, common spaces that can be shared with larger groups, or experienced alone. Our Lobby has a beautiful fireplace, turntables with vinyl. The "Dragon Lounge" faces a majestic outdoor fireplace with a custom pizza oven. Book the entire property for family reunions, private parties, wedding receptions, or any other events. The Mayhew Inn is a great home base for enjoying the activity of downtown Grand Marais or easily getting away for day trips to the BWCA. Drive up the Gunflint Trail for day adventures, lunch and hikes but stay at The Mayhew Inn to experience all that downtown has to offer just footsteps out the front door. Every day at The Mayhew Inn is magical whether it is sunny and warm or stormy and wild. All year round nature's magic unfolds right in front of you over the greatest of lakes, Lake Superior. In 1873, Henry and Thomas Mayhew had a store in Grand Marais that served as a trading post, which was located on a point formed by the east and west bays. This is the approximate location of the current Coast Guard Station. Their brother Joseph Mayhew was also the first lighthouse keeper in 1886. They had a house on the point and then built the first lodging establishment in Grand Marais called The Mayhew Hotel. The building that served as the Mayhew’s house now sits as the Cook County Historical Society & Museum. Many of the archival images that you now see were taken from the approximate vantage point of the new Mayhew Inn. Come experience all that The Mayhew Inn has to offer! Hi there! Our names are Amy, Joel and our son Max. We have two pups named Myron & Fletcher. We spend time on our classic 1967 Chris Craft Wooden Cruiser on the St. Croix River when we're not spending time in Grand Marais and traveling to other places. Joel spent his summers in Grand Marais as a child. After a long lapse in visiting the north shore, we started making it a yearly Memorial Day tradition, and for Max's birthday. After staying at the Artist Loft we fell in love with it immediately. There really is no other place like it in all of Grand Marais. Old style clawfoot tub. Note that the tub is up on a small pedestal, so it may be tricky for older people to climb in and out. Fabulous View out of the living area and master bedroom, with a sweeping view of the Lake Superior and Grand Marais Harbor, Lighthouse, coast guard station and sailboat moorings! Just the mainstreet separates you from the stonesthrow to the beach of harbor Park! 100% cotton percale sheets, washed after each stay. Plenty of clean new bath towels, hand towels and washcloths. dinette with 4 chairs, and 2 additional barstools for additional seating. Vintage Sony Quadraphonic Turntable with vinyl from the 60's - current. Lots of great books available at The Loft for your reading pleasure. We keep some of the classic board games on hand like scrabble, clue, yahtzee, uno and decks of cards. Overlooking the Hills above Grand Marais! Outdoor Music events are often held in the Outback Garden. Grand Marais Has a vibrant Music scene! We loved it from the minute we walked in and hated leaving at the end of the weekend. It is so cute and cozy. We’ve never stayed right in Grand Marais before and loved being able to walk all over. Can’t wait to return! The Mathew is the perfect spot to enjoy Grand Marais. In the heart of the town with decks to enjoy the view of the lighthouse and harbor. Accommodations are comfortable and Annette is very helpful. Just lovely. I stayed here last summer and was so excited to return. I had heard some changes had been made and boy had there! They really upped their game. Our apartment was the same all except our private screen porch which I was really disappointed at first was no longer there. But, they instead created a huge deck space up top that overlooked the lake. We had our coffee there every morning and was very satisfied. We also really loved listening to records. It was such a fun addition. I just love this little spot and hope to stay here again next year! Great location. Hosts were wonderful. Grand Marais, alone, is the perfect get away. The Mayhew Inn puts you right in the center of it, with an amazing view of the lake. It's a destination we will keep coming back to for years to come. Amazing location and stay! Will be back! For the "One Night Free Winter Promotion", please send me the dates via email and I will send you a custom quote reflecting the discount!